One would think dying is better than spending 12 years of your life in prison for a case you have little knowledge of. And come to think of it, spending those 12 years living each day knowing that the hangman will one day come with his noose, and hang you, like he did with Saddam Hussein, is torture at its worst. Yet, you can only come to terms with the harsh reality that your spouse is dead, in another prison after that span of a life. One would rather live, one more day and tell the people the untold story, the story that gave you the will to die, and the will that made you to live, even after your husband’s death. Well, this is no script. 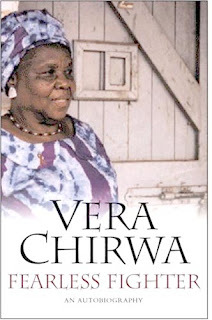 It is a true life story, the story of Vera Chirwa, one of the greatest of Malawian human rights activists. Not only is she able to fight for women’s rights. She has been there, done that and has got the experience which other women rights activists can only dream of: PRISON. And 12 years of prison is tough. It is very rough. Mind you, this is no other prison, but Dr Hastings Kamuzu Banda’s prison. Recounting the ordeal in her book, Fearless Fighter, Vera takes us through the trek to the very heart of Dr Banda’s dictatorship, where Dr Banda wanted no voice but his own to be heard. Any kind of dissent, as was demonstrated by Vera and her husband Orton, alongside others like Masauko Chipembere, Yatuta Chisiza and many more, was apt to face imprisonment, exile and death. At times such deaths were very violent, either you ended up as meat for the crocodiles down the Shire or in staged car accidents, it is only fortunate that Vera survived to tell us this story, so we can piece up history, and see a bit of the missing link. Fearless Fighter finds itself on the bookshelf and the bookstall as one historic account, a story that could not have been told in the one party regime, but one that is very vital to the history of the Malawi people. It complements Sam Mpasu’s Prisoner 3/25 of Dr Kamuzu Banda of Malawi, Reverend Patrick O’Mailey’s Living Dangerously and a lot of other literature on the one party dictatorship. Like any good autobiography, the book goes to the real Vera. It is revealing. The essence of her character becomes clear, and as the title suggests, she is a fighter. A fighter is, first and foremost, one who is able to think beyond the normal line of thinking. Oppression becomes clearer for those who are able to think beyond. Vera’s first trial at being disobedient, which is separated by a thin line from fighting for freedom, is clear when she is five. Her grandmother tells her to do the plates. For once, she chooses to say no and although she is reprimanded by her parents, one thing is clear: she is able, even as a little child in a strict family setting, Vera is able to question authority. From this book, Vera’s fighting spirit is exposed more when she becomes the first Malawian female lawyer. She studied law, after she was already got married. Her achievements in the Banda regime were overshadowed by that very regime, which wanted all praise to go to Kamuzu. She tells us how she formed the League of Malawi Women, that influential women grouping of the Malawi Congress Party (MCP). Fearless Fighter is a story of lost hopes. It tells of the crushed hopes people like the Chirwas had on independence. They thought self-rule would bring a lot of good things to the people in the republic. That was not to be: Dr Banda proved to be thinking on another level, as the more he drunk from the well of power, the more he abused that power and dealt with any form of dissent. It is a story of betrayal. A story of miscarried justice. It is a story of a struggle against oppression. What makes it even more powerful is that it is told by a woman, and from the Malawian viewpoint, the story told by a mother, or grandmother, or aunt is powerful. It is a story of family seeking survival, running into exile to flee from Banda’s eyes and ears. It is one of a family torn apart by political forces. At times, you can shed tears. For instance, when she recounts of her abduction, together with her husband and son on that fateful Christmas Eve. You can shed tears to think of a woman, who does not even know where her husband and child are taken; a woman who does not know where she is being taken to by the security forces. And, she soils herself. It is even heart-rending to note that the justice system did nothing to ensure that justice was seen to be done on the Chirwas. They were tried in a traditional court, where those administering justice, the chiefs vowed that they were only there to send those trying to oppose Banda to prison. They were never given a chance to a fair trial. One would wonder, how just is justice? Is the law meant to protect the powerful and presumably mighty people? These may be questions for some other time. Faced with a death sentence, Vera spent 12 years in jail and briefly saw her husband once in that time frame. She only sees her son when he is released, after he goes through torture at the mercy of the forces that were. The greatest of pains comes when she learns of her husband’s death, shortly before her release. What is most interesting is that when she is released after Banda faced pressure from international organisations, and starts advocating for a new Constitution as one of the steps towards multiparty democracy. It is here that Vera’s spirit goes to another plane: forgiveness. How can you forgive the people who sent you to gaol for 12 solid years and killed your husband? That is what makes Vera unique and remarkable. She goes ahead to fight for the rights of Malawi Women through the Women’s Voice and the Malawi Carer. She also goes ahead to fight for the rights of prisoners. Interestingly, Vera exposes that Bakili Muluzi, Dr Banda’s predecessor, offered her different positions in his government. The president wanted her as a cabinet minister or a position in the corps diplomatique. She turns down these offers, choosing to criticise the president on how he was abusing the women. She was against the president’s abusing women, by making them dance for him at rallies, a thing that was imported from his predecessor’s rule. An angered Muluzi spoke against Vera at a public rally. It is clear that Vera had a hand in the fight against the colonialists. She was influential in the fight against Dr Banda’s dictatorship. She pointed out the ills in the multiparty era. One can only think that she has set a pace. All those involved in politics and other fields must know that Malawians are itching for books about their lives.